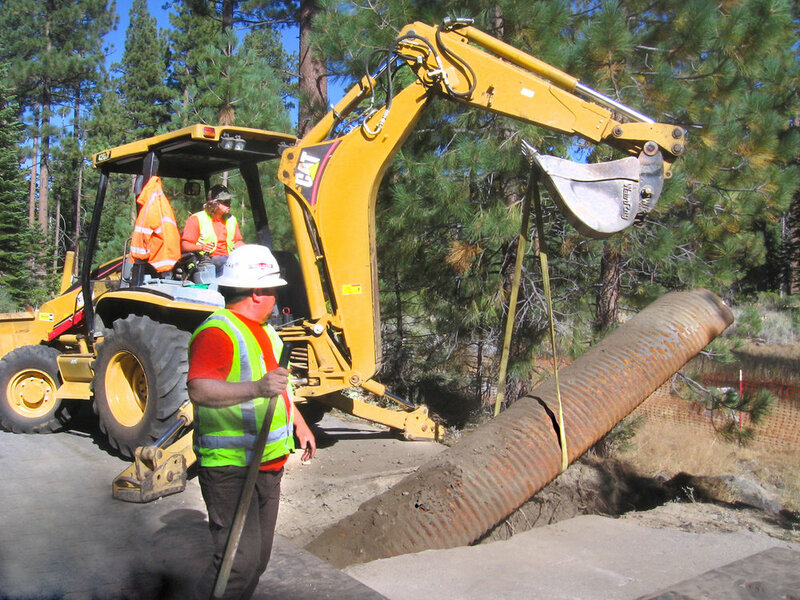 Although Nielson Construction primarily works around the San Francisco Bay Area, Nielson has worked throughout California, including the Lake Tahoe area. The Fallen Leaf Campground needed renovation of their property so they could continue to offer a safe and beautiful atmosphere for their visitors. As the site is surrounded by forest, many of the trees required protection to ensure they would not receive any damage throughout the following months so our crew protected the them before work began. Once proper protection was in place, the site underwent the removal of old asphalt paths and decaying roots and trees. Deteriorating metal culverts were also removed, and subsequently replaced by concrete culverts and catch-New storm drains were also installed. Once all the base work was complete, Nielson patched the road, and replaced the asphalt walkways, driveways and parkways. Nielson worked through the beginning of snow season to finish the reconstruction of individual campsites before the heavy winter set in. With the work finalized, the Fallen Leaf Campsite was ready to welcome their eager visitors for the season.